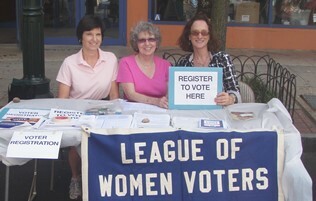 The League of Women V oters is successful because of the presence of thousands of volunteers in local communities across New York. Our tradition of non-partisan, grassroots education continues through the support of donors like you. We are pleased that you have chosen to support your local League by making a tax deductible gift to their grants management fund at the LWVNYS Education Foundation. To make sure your gift gets to the correct local League, please select that local League from the list in the drop down menu below. List of local Leagues that can receive gifts for their Grants Management Account. Provide a mailing address or an email address if it's okay for us to let them know about your gift. Please provide the contact information for a family member or friend you'd like us to notify.